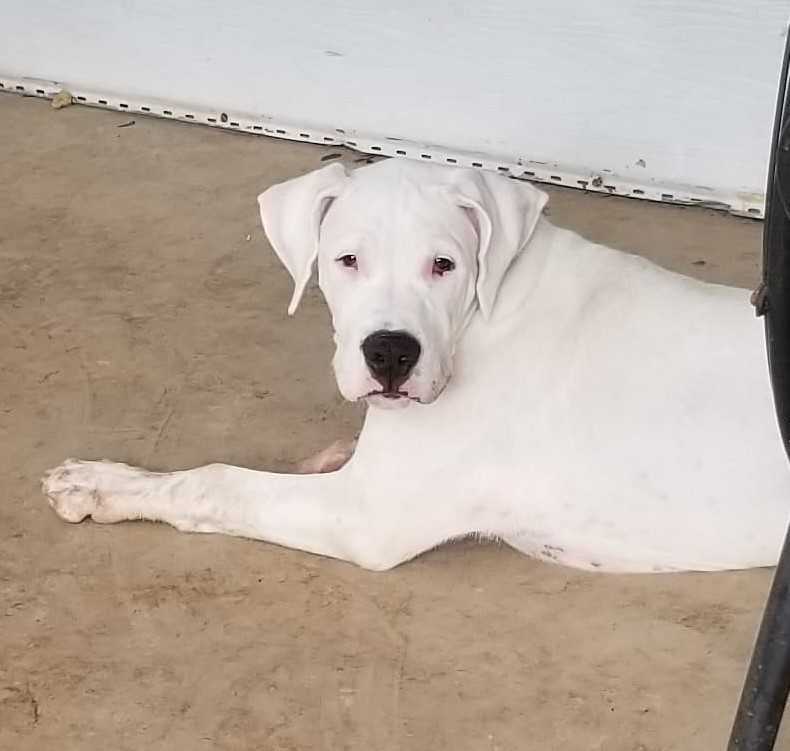 Quinn (Harley Quinn) is young 6-7 month old female deaf dogo girl ready for a fun home! She still has a lot to learn from her future humans and has stolen the hearts of everyone she meets. Quinn can't hear but that doesn't stop her from being cute and playing with the friendly pack she is currently with temporarily. She is loves everyone and everything so socialization is going in the right direction for this lovable girl. Quinn is very silly and loves to play with her furry friends in the house but in the yard she kind of turns into a pancake and lays down!! This is funny quirk the foster is going to help her overcome! Deaf dogs must be properly trained and we encourage you to do some research about how to raise deaf dogs properly before considering adoption. They make excellent loving companions and want to be near their humans as much as possible! Our deafies must go to homes with safe secure yards and to owners willing to take the time to train with their deafie. The rescue will provide initial training and serve as a resource for all of our adopters at all times! This sweetie is looking for a foster or adopter before Sept 5th as her current temporary foster already had plans to be away. If you are interested in Quinn please apply!! Also, her slightly older sibling is also available and his name is Parker! In order to adopt Quinn the applicant must: have a safe and secure fenced in back yard, have the extra time and patience for training, be home a lot as deafies do not like to be left alone, have a submissive/friendly dog home (no more than 2 other dogs). We prefer a home with owner home most of the time and a home with deaf dog experience or willing to become very educated on raising a deaf dog. She is young and friendly around kids but with deafies it is best to have older children that don't flop their arms around a whole lot because that tendds to confuse dome deafies at times. Deafies make amazing pets when properly raised and we will do everything in our power to make sure our deafies are in homes where they can thrive!